I had a great weekend of cycling mixed in with the Grand Depart of the Le Tour de France 2015, the time trial on Saturday was in Utrecht, it was packed with people in full party mode. On Sunday I headed down towards Gouda to take in stage 2 that started in Utrecht with a finish in Zealand. Hot sticky day, with temperature into the upper 20s – I headed out from Amsterdam with destination Utrecht just before 12:00 (noon) – I had punched in the From and To destination in my new Hammerhead app. The app gave me the direction to head through Amsterdamse Bos pass Uithoorn and Kamerik before reaching Utrecht. From the start, I felt out of energy, so it was a bit of a struggle to get to Utrecht, a few times my Hammerhead device was not keeping up with which side of a canal I was on or give me right direction in a roundabout. I had to backtrack a few times when I realized I was heading in the wrong direction. 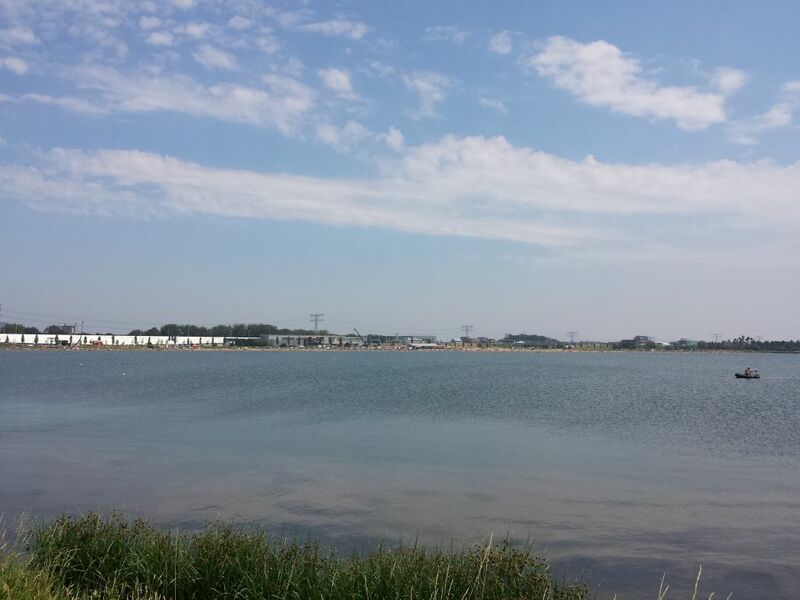 I did eventually get to Utrecht, on the way into Utrecht I came across a pond with a beach that was packed with people, I was hot and it had been great if I had time to stop, unfortunately, I was behind on time to reach the time trial course in Utrecht. I got into town and it was a big party going on, people all over, eating and drinking beers, the whole city center was like a big party. Around the time trial course, there were layers of people cheering on their heroes when passed by. Here is a clip when a Dutch rider was passing by on the time trial course, really loud. 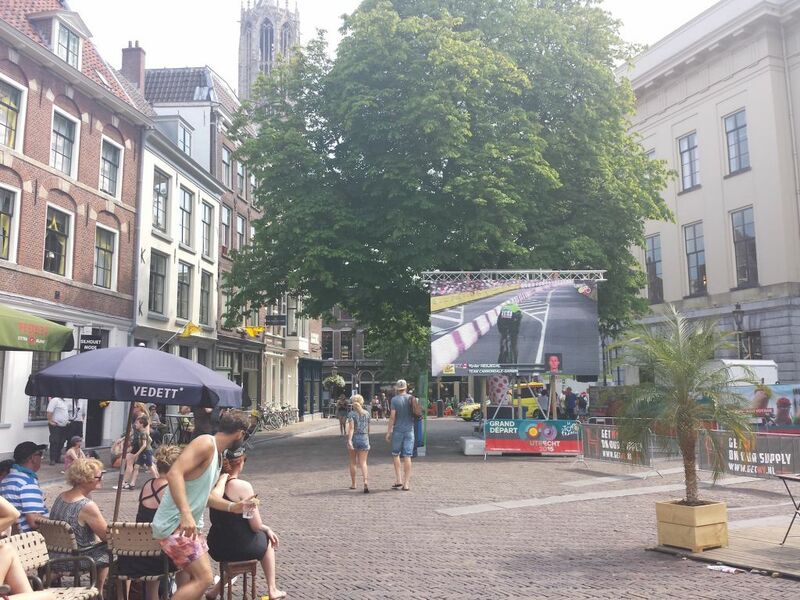 Every square in the city center of Utrecht was filled with people that could watch the race from big screens, no need to go to the time trial course. The Grand Depart as it was named was a great experience for me, I really enjoyed the day. At the end of the day, I had a bike ride back home, it was no rush so I took my fair time to get back. Here is my picture gallery from Saturday. When I reach the bridge that I was going to catch the riders, it was already packed with people, I found a good spot. I had to wait about 30 minutes before the breakaway group came past, we were lucky this day that there was a breakaway then it would not have over so fast. When you watch the Tour De France or any road bike stage – the riders pass in less than a minute and then it’s over. A breakaway is great – here are some pictures from the breakaway. Before the peloton came, cars and motorbikes passed by, what I thought was interesting is that there was French policeman with full police gear’s following the race, I guess they have the jurisdiction over the Tour De France race in any country the race goes through. While waiting for the peloton the weather starts changing, the wind picked up a few drops of rain came, just before the peloton arrived the sky changed with helicopters that start buzzing overhead and when the peloton finally arrived it was just over in a few seconds. It was time to turn back home, the departure from Gouda was quick had the company with a group of riders, by the time I reached Aalsmeer I was on my own. That is when the rain started to fall really heavy, so I had to get under a roof cover for a few minutes before I could continue to home. I had a great weekend of riding and watching Tour de France live.